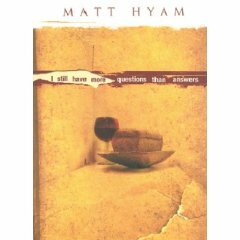 Over the weekend I read Matt Hyams book, I Still Have More Questions Than Answers. I was initally drawn to it because of the titles… its one of my key phrases I think! Then having a flick through it I saw one of the chapters was titled “Messing up the Church” which grabbed my attention even more! It’s a quick read, I read it on the 6 hour car journey back up from England at the weekend. Its a very personal account of the journey of Southampton Vineyard and of Matt himself. He writes candidly about his struggles and questions. I was encouraged and challenged and provoked as I read this book… at one point Matt shares how they scrapped their very slick, polished, professional Sunday services where the “professionals” lead the worship, in favour of giving each housegroup responsibility over leading the Sunday services, providing everyone with a chance to bring their gifts to the table . It’s something I’ve been thinking about lately… what we display on Sunday at our meetings is naturally what we put our efforts into. Does it reflect the priorities we want to have, maybe even the ones we say we have?